Dow daily putting in a pin bar up off triangle bottom. Dow and nikkei looking higher and dax is a maybe while asx lingers around support. NFP day today so might be a bit dull til then. Dow looks like wanting to push higher but wait for the break. Dow seems happy with it's wedge break. Still on course for a retest of the May highs. Looking at the simplest most profitable trading strategy since year 2000. 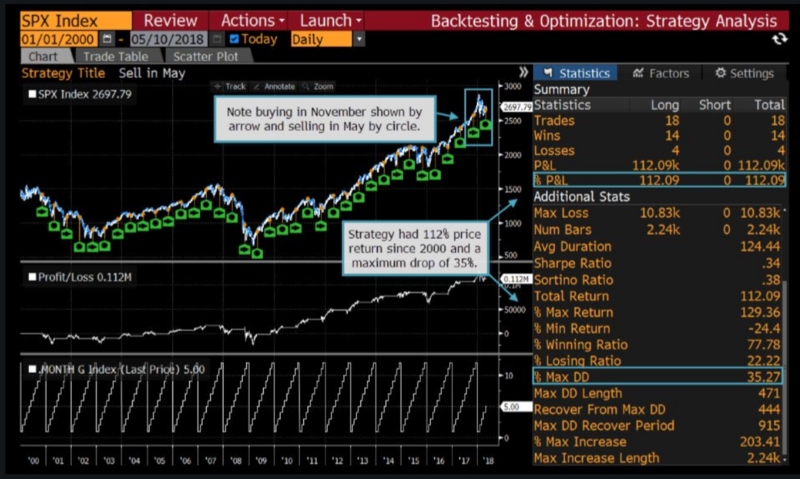 Buy in November and sell in May, 112% return. How many months did it lose?How many consecutive years did it lose? If you look at the chart it tells you there were 18 trades (one a year) of which there were 14 wins and 4 losers. If they had two consecutive bad years do you think somebody would bother ? Err ... yes, that's how trading works. A strategy that has a winning ratio of 78%, a max drawdown of 35% and a return of 112% over 18 trades. That is not trading, that is investing.If it does not work ,leave it as a long term term investment. That is not trading a all. 6 months is not investing, 10 years is investing. Warren Buffet would be laughing at you. When did you make up those definitions? He would most certainly be laughing at at intraday price action forex scalping EA trader.That is why I am the one who never dun it. Idea is good ,but not practical, after you lose 2 years amd are into your 3 rd year, then you deicide it may not work in the future.I admit Casey is very good at theories. It is like the trend follower who can't take the 7 losses in a row and 6 months of no profit.He quits because it is not practical. This last post does not make any sense, please try again in English or use the Google translation function. That last post doesn't make any sense either. The strategy is successful. The proof is in front of you. One trade lasting 6 months, taken every year, for 18 years results in 14 wins and 4 losers (this obviously includes the crash 2007, 2008). What is there not to understand about this. You are not going to work for 2 years without pay, but you expect others to do it.If a strategy had a 2 year drawdown and no profits, nobody is going to trade it. It is just another trade, you open it in November and close it in May. Over the last 18 years 14 were winners (78%) and 4 were stopped out (22%). You never actually read the post did you. This happens often, you jump in to critique without actually reading the play, this inevitably leads to ongoing confusion as the points you raise don't have any reference or bearing on what has actually been put forward. No one said it had to be your only trade of the year, that doesn't even make sense. Any strategy could have 2 losers in a row, so what. It is a trade not an investment, it doesn't pay dividends through the year, a profit is realised when the trade is closed. Many traders hold trades open for months at a time. None of the points in your last post have any meaning or relevance to the actual strategy. , any chance of AUS200 breaking 6160 any time soon? Then it's a clear run to the all time high of 6860 from 2007. Hi Good question, and good timing for the question. There is a decent chance the ASX could reach the 6160 level as this month is our financial year end, meaning often (no guarantees) the large institutions (local) fiddle their books for this (tax tricks). If needs be, they'll get up there against global headwinds. But you never know what they're doing... I'll have a think about it. That's right, the high just before the crash, it has taken a long while. I was looking at the monthly chart and admiring that near vertical climb between 2003 and 2007. Indices down as Trump happily ups the ante. AUS200 looking for another breakout, DAX considers getting back inside the range, DOW looking for support while Nikkei looks to the topside. Start the week testing support after Hong Kong index drops 1.2%. Dow, Dax, Nikkei and FTSE100 daily charts. Dow trying to put a bottom in at prior support, the others following suit. 1 hour and Dow daily charts. Indices halting decline over the Asian session, dow, nikkei and aus leading the way, looking for dax and ftse continuation. Dow undecided yesterday so now retesting support at 24084. Dax drops into prior range and into open space, will need dow to rescue. So dax was indeed rescued by the dow as 24084 held and price reversed in the morning session, then a surge up for both after midday on news Trump was not planning to invoke 'national emergency law' on China. dow and dax comparison 1 hour charts.